All the words listed in this search are conventional spellings of Greek letters. 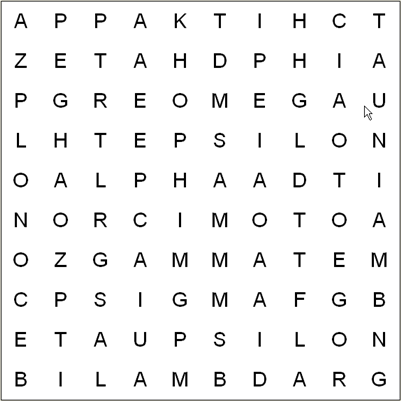 The only Greek letters that don't appear in this puzzle are those with spellings that are two-letters long (like PI and MU). Click on the grid to open a printable version, along with its word list, and solve the puzzle offline. For a real challenge though, try to find as many words as you can on the screen, without looking at the word list. And here is that solution to the last feature puzzle I promised you! Click on the grid to open a printable version of the full puzzle and solution in a new tab or window. Did you miss any of my previous feature puzzles? No problem! I've put together a Feature Puzzle Archive right here.